While most microfinance institutions have agribusiness products as part of their offering, at Juhudi Kilimo, it is the main thing. “Focusing on farmers and agricultural value chains gives us an edge in terms of impact to the lives of our customers,” says Cleopas Ndaramu, the Chief Operations Officer of Juhudi Kilimo, adding that agriculture in Kenya is like an ocean, which cannot be exhausted. Lending to farmers is particularly challenging. Most financial institutions (MFIs) shy away from financing smallholder farmers as they perceive this to be high risk. Agriculture is associated with unpredictable weather changes, diseases, low returns, poor infrastructure, weak value chains and poor markets. Besides, it requires different lending instruments from those used by various MFIs in the urban areas. Juhudi Kilimo is an MFI that is committed to providing market-driven and wealth-creating financial services that empower rural smallholder farmers to create sustainable agribusinesses and improve their livelihoods. “By supporting farmers and all those in the value chain, we are able to transform the lives of many people especially the unbanked,” says Ndaramu. Headquartered in Nairobi, Juhudi Kilimo was founded in 2004 as a programme within K-REP Development Agency and in 2009, spun-off to become an independent for-profit social enterprise (organization)with its social good built into the business model. Despite having started with only two branches, the MFI has opened twenty rural branches. Its growth is evident in the thirty products it offers today from the one product it started with (dairy cows). “We hope to diversify our product offering in the coming year by adding two more products to those already in existence,” adds Ndaramu. Juhudi is owned by three shareholders – the Acumen Fund, Soros Economic Development Fund (SEDF) and the Grameen Foundation based in the United States. In an effort to achieve financial inclusion, Juhudi Kilimo offers its products in various models. These include: asset financing, training, insurance and linkage. Through asset financing, Juhudi finances specific agricultural assets that offer immediate and sustainable income for farmers. “We provide rural farmers with a unique type of micro-asset financing to purchase wealth-creating agriculture assets such as dairy cows, irrigation systems, poultry, greenhouses, water tanks, cooking stoves, solar lamps and motorbikes among others,” says Ndaramu. It does so by directly purchasing the asset for the farmer or agri-prenuer who then pays them. “This helps in ensuring that the funds are not diverted to other non-profit uses,” explains Ndaramu. “In our experience, micro asset financing results in positive economic and social impact given that such assets generate income to support livelihoods. Also, there is reduced risk on the side of the farmers since the purchased assets act as collateral against the loan granted,” he says. Through training, Juhudi Kilimo offers information on financial literacy, business management and farming technology, to its customers. Insurance also enables farmers to have their dairy animals covered. The package given to the farmer is inclusive of premiums and vaccinations such as the East Coast Fever vaccination. “We have partnered with Sinai Veterinaries to vaccinate the animals for our customers, something that would be difficult, for an individual ,” explains Ndaramu. 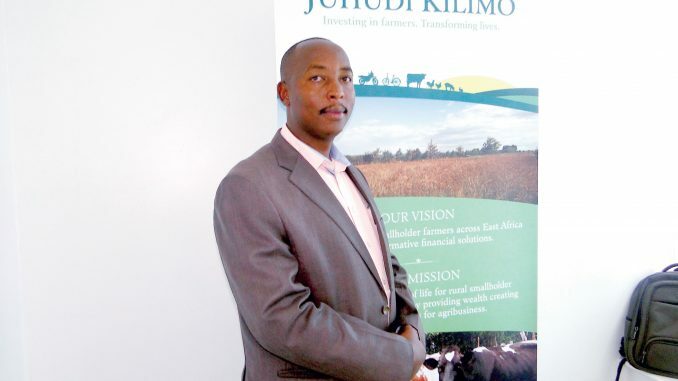 By partnering with other players in agri-business, Juhudi Kilimo benefits its customers in various ways. “We organize meetings between farmers and suppliers of farm inputs and other requirements and host them in our offices. This way, the suppliers are able to sell their products, while the farmers purchase the ones they require,” he says. With such tailored products, Juhudi has seen its loan book grow tremendously, from Kshs. 723million in October 2015 to Kshs 1.1 billion in 2016. The loan book is spread to 34,000 active borrowers. In spite of its achievements, Ndaramu says that stiff competition from other financiers who have agri-lending products has been a major challenge. The commercial banks for instance, he says have become a major competitor, since the capping of rates. “While banks have been required to offer loans at a standard interest rate of 14%, microfinance institutions are limited by the cost of running their businesses,” he explains. Juhudi focuses on its unique product offering, turnaround time, personalized customer care and tailor made customer training interventions to address the challenge of competition. Going forward, Ndaramu says that the fast growing MFI intends to introduce a mobile money transfer platform to serve its customers effectively and efficiently. “We will use the platform to deliver emergency and health loans to help our customers cater for inpatient bills,” he elaborates.